Where Do Adult Gerontology Nurse Practitioners Work? What Is an Adult Gerontology Nurse Practitioner? An adult gerontology nurse practitioner (AGNP) is an advanced practice nurse with a clinical focus on treating patients from adolescence through adult ages and into advanced age and geriatrics. Requiring an advanced degree and training, the adult gerontology nurse practitioner works with a broad patient population in a variety of settings, from private practices and clinics to hospitals and treatment centers, and has more independence as a practitioner than a typical registered nurse. Unlike most RNs, an adult gerontology nurse practitioner has the authority to prescribe medicines, order and analyze diagnostic tests and develop and implement full treatment plans for their patients. This type of nurse practitioner, known as an AG-ACNP, works with adult patients who are acutely ill. They may practice in areas of critical care, cardio-pulmonary, emergency/trauma care, oncology, surgery, and more. They are important members of the healthcare team and have the ability to diagnose and treat a wide variety of medical conditions. They are commonly found in emergency rooms, ICUs, and other acute inpatient or hospital settings. Many schools have specialty programs specifically designed for the AG-ACNP. The adult gerontology primary care nurse practitioner, or AG-PCNP, focuses on the primary health management of adults and adolescents. Their duties include educating on maintaining healthy lifestyles, disease prevention, and managing chronic illnesses. They can work in a variety of healthcare settings, including internal medicine, student health, clinics, ambulatory care centers, and more. Community-based care is a big part of their healthcare role. Students can opt to take a specific AG-PCNP program. In order to become an adult gerontology nurse practitioner, students must first complete their Bachelor of Science degree and pass the NCLEX-RN exam. RNs must then complete a Master's of Science degree program, in which they will take advanced courses in pathophysiology, clinical assessment and pharmacology. The final step in becoming an adult gerontology nurse practitioner is obtaining a nurse practitioner certification from the American Academy of Nurse Practitioners or the American Nurses Credentialing Center. Read more about adult gerontology NP programs, adult gerontology post master's NP graduate certificates, and RN to NP programs. To search and apply for current adult gerontology nurse practitioner positions, visit our job boards. What Are the Education Requirements for Adult Gerontology Nurse Practitioners? An advanced specialty, the adult gerontology nurse practitioner position requires a minimum of a master's degree in addition to an active RN license. Some aspiring AGNPs may choose to earn a Doctor of Nursing Practice (DNP) degree, but typically an MSN is the minimum requirement. Due to the high level of responsibility and authority of this position, healthcare employers require prior professional nursing experience. Professional certification is also usually required of adult gerontology nurse practitioners. Learn about post-master's adult gerontology certificate programs. 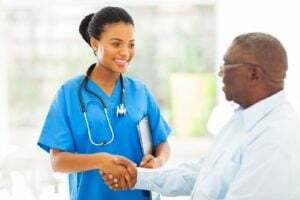 Most adult gerontology nurse practitioner positions require certification as a nurse practitioner, offered by the American Nurses Credentialing Center (ANCC) and the American Academy of Nurse Practitioners (AANP). The ANCC offers two certifications for adult gerontology NPs: one in acute care and one in primary care. Eligibility requirements for the ANCC certification include an active RN license, completion of a master's, postgraduate or doctoral degree in nursing with an emphasis on adult gerontology nursing and a minimum of 500 faculty-supervised clinical hours in the adult gerontology nurse practitioner role. In addition to working with patients in private practices, specialty clinics and hospitals, adult gerontology nurse practitioners are in demand in rural areas with limited access to physicians, community health centers and college campuses. AGNPs also work for healthcare technology companies, perform healthcare research, teach in schools and a significant number have their own private practices. An adult gerontology nurse practitioner cares for patients from adolescence, through adult ages and into advanced age. AGNPs conduct patient exams, diagnose health problems, develop patient treatment plans, order diagnostic tests and interpret results as well as prescribe medications. The AGNP also evaluates the performance of prescribed treatment plans, adjusts as necessary and keeps detailed records of a patient's medical history and progress. The adult gerontology nurse practitioner also educates patients and caregivers about the ongoing management of their illnesses and diseases. What Are the Roles and Duties of an Adult Gerontology Nurse Practitioner? Adult nurse practitioners can expect a median salary of around $95,422, with a range of $80,023 - $119,479. Geographical location is the biggest factor impacting an adult nurse practitioner's salary, followed by career length. Employment of advanced practice nurses, a segment that includes nurse practitioners, is projected to grow 31 percent from 2014 to 2024, much faster than the average for all occupations in the U.S. This expected growth can be attributed primarily to a large aging population and an increased emphasis on preventative care in the healthcare industry. Learn more about NP salary and other APRN career options.